Sub: School Education - School re-opening day on 12.06.2018 - Exemption to Muslim teachers to report the schools on reopening day i.e on 12.06.2018 duly availing Optional Holiday on 12th June, 2018 on account of 'SHAB E QADAR'(under special circumstances)-Certain Instructions - Issued. 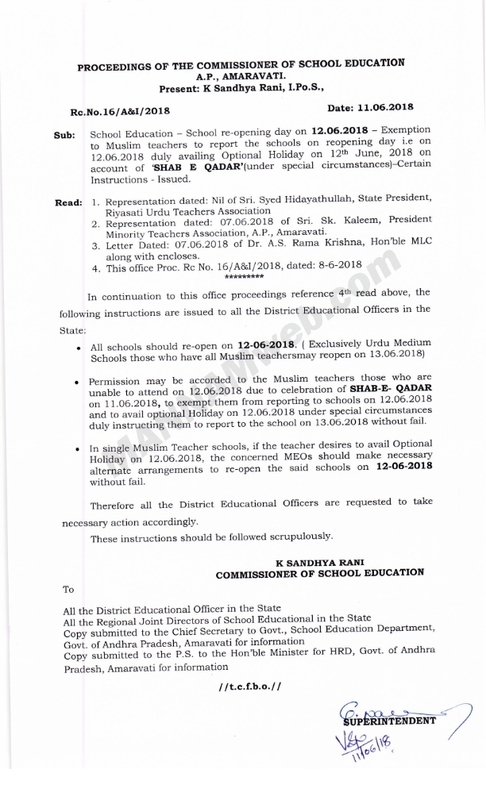 • Permission may be accorded to the Muslim teachers those who are unable to attend on 12.06.2018 due to celebration of SHAB-E- QADAR on 11.06.2018, to exempt them from reporting to schools on 12.06.2018 and to avail optional Holiday on 12.06.2018 under special circumstances duly instructing them to report to the school on 13.06.2018 without fail. • In single Muslim Teacher schools, if the teacher desires to avail Optional Holiday on 12.06.2018, the concerned MEOs should make necessary alternate arrangements to re-open the said schools on 12-06-2018 without fail. Therefore all the District Educational Officers are requested to take necessary action accordingly.